This interactive presentation contains the latest oil & gas production data from 11148 selected horizontal wells in the Permian (Texas & New Mexico) that started producing since 2010 (2009 for New Mexico), through February 2017. As the above graphs shows, oil production in this basin has kept rising through the first 3 quarters of 2016. Because data for the last couple of months is very incomplete in especially Texas, I expect that, once revisions are in, we will see that this rise has continued since. In the “Well quality” tab the production profiles for all these wells are shown, averaged by the year in which production started. You can see in the bottom chart there that while a 2013 well needed 4 years to reach a cumulative production of 100k barrels of oil, on average, by 2015 this was only 15 months, and 2016 wells need only roughly 9 months to get to this mark. The status of all these wells is shown in the “Well status” tab. The steep drop in new wells flowing in the last few months is more indicative of the incompleteness of the data, than of an actual decline in completion activity. The bottom chart there shows the production level of all wells by % of total. This mix of different production levels has remained remarkably steady over time. The last tab (“Top operators”) shows the performance and location of the largest operators. Pioneer Natural Resources and Concho Resources both appear to be vying for the top spot. Note that, as is usual in my presentations, this only includes the production from horizontal wells. The graph clearly shows how well performance has improved over time, and what this could mean for their ultimate recovery. Extrapolating the curves for the wells that started in 2016, leads to a recovery of about 300k barrels of oil per well before they hit a production rate of 20 bo/d. This is in sharp contrast with the 2012/2013 wells that only manage to reach about 1/3rd of that (100 kbo) at such a rate. This of course assumes that these decline patterns hold up over time, which is not a given. In the “Well status map” the status and location of all these wells are shown. For Texas not all well statuses are available. By Wednesday I expect to publish an update on North Dakota, followed by one on all all covered US states on Friday. You’re welcome Paul, thank you for the feedback. Whenever I see EURs reported, I always prefer to have a look at the underlying type curves & assumptions myself. Unfortunately those are not often shared, making it impossible to have a good discussion about them. I watch every time Ennon updates here to see if Permian and particularly Pioneer’s fast off-cliff drop at 50~100 repeats or not. It it break the curse, it means EUR oil might top 300~350M. Guess that if the 2016 wells repeats the curve of 2014-2013, there will be a sell off PXD and oil price will go up? Thanks Enno for your quick response. Encouraged by your quick response, I want to pour some cold water on some of the tight oil producers. Production ramp up is a process of clean up. Water is introduced to reservoir during fracturing which blocks oil to flow into fracture due to relative permeability reason. When trapped water is produced water saturation is reduced. As a result, oil relative permeability is increased, and oil rate as a function of relative permeability is increased. But as a function of time, assuming no relative permeability issue, it decreases. The balancing point is the peak rate. Once it reaches the peak rate, it declines. The decline rate depends on completion efficiency. The higher the completion efficiency, the higher the decline rate, and vice versa. Time as a function of flow rate is in the denominator. For radial flow is log(t) relationship. For linear flow, it’s square root (t) relationship. There is no mathematic wellbore model that can exactly describe this kind of completed well. But despite log or square root or some kind of combination relationship, the denominator increases fast with time elapse. This is assumed a neutral completion efficiency with no wellbore damage or completion enhancement (fracturing or acidizing). For the completion efficiency, another factor which we call it skin is introduced also located in the denominator. For a damaged well, the skin is a positive number. For a stimulated well, the skin is a negative number. When a negative number is in a certain part of the denominator, the number of the denominator as a whole will be very small and consequently rate is very high. When time increases, the effect of the negative number gets smaller and smaller. Rate drops drastically at early time and slows down with time elapse. There is some limitations for time and the skin number, the denominator as a whole can’t be negative. Rate to lateral wellbore length relationship can be treated on per foot production basis, and that’s why vertical well is not economical for very low permeability reservoir. 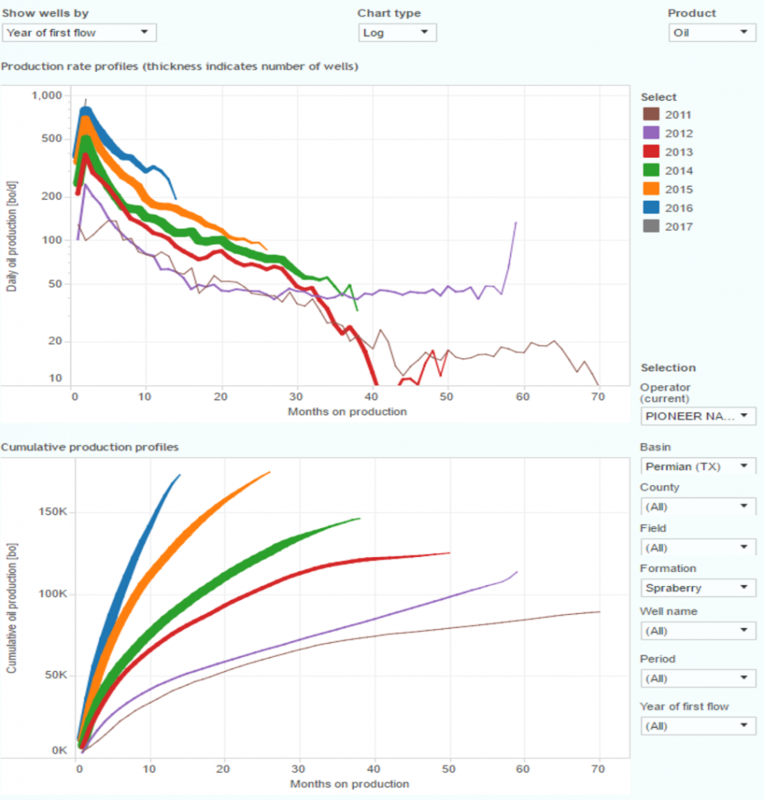 With time increases, we can see the production rate of late drilled wells cross over with that of the early drilled wells. It means the late drilled wells enter a pseudo steady state (pressure decline propagates to the boundary. For multi-wells pressure decline interferes each other) faster than the early drilled wells. Even though not all the boundaries are felt by dropped pressure, at least partially. In pseudo steady stage, the decline is exponential. The decline rate is faster than the transient stage. To make a summary for high completion efficiency resulted by high stage and cluster density, it makes early time rate high that otherwise should be low. The EUR can’s be significantly boosted by increasing completion efficiency. Without increasing the distance between two wells, I would expect the oil rate of late drilled wells will all cross over with that of early drilled wells for similar reservoir. The higher the density of stage and cluster, the quicker the rate cross over. The reservoir is a close certain amount for both. If more is recovered earlier, less will be recovered later. The expected more than one million BOE EUR will not be reached due to use the same decline curve analysis. The late fast decline is the wrath of science. The low breakeven price based on such a high EUR is not true. Investors should be alerted. Drafted in a rush, I am sure there are English problems. Thanks again, Enno, for providing such useful information and a place for us to leave comments. This is a simplified explanation, but without going into the math would a very rough approximation be able to use the first 12 to 24 months of more recent wells, tacked onto the 24 to 60 month well profile of older wells to get a very rough approximation of the well profile? I realize that this is very simplistic and assumes the newer wells will not have a well profile that crosses below the older wells in later months (probably an optimistic assumption). 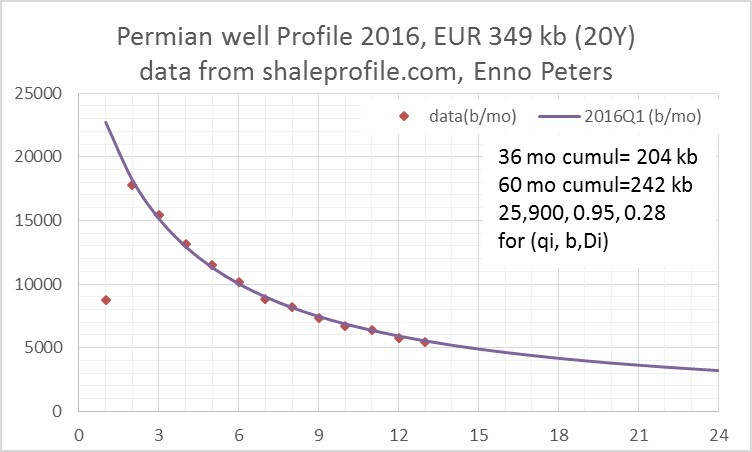 It looks like recent Permian wells (2016 quarter 1) are not likely to have an EUR above 327 kb, with about 304 kbo and 10kboe of natural gas and maybe 12 kboe NGL (assuming 0.21 b NGL per MCF Natural gas). Does this seem in the right ball park, too low, too high? On rereading your comment you seem to be saying more than 1 million BOE does not seem reasonable, it seems you are implying that it will be less than 1 million BOE, how much less is not very clear one half, one third? Awesome comment, thanks so much for sharing all this. I learned a lot from it. The visualizations of the data here, together with the added commentary from industry experts like yourselves, makes an excellent combination in my mind in trying to understand all these developments, and I created this forum with this aim in mind. (making a guess at your language background) Xie xie nin! Have you noticed that Pioneer’s first quarter 2016 wells (8~28) had a second big drop in production? from over 300 to only 200 in just 1 month? It is worse than Continental’s Ludwig well which had the 33% drop over 3 months after offset pad fracked. I have to admit that I visited at least once a day at Enno’s website to watch for the ever changing dynamics of shale profile! here is the screen capture, and looks like not only 2016 Q1 wells started the 2nd leg of fast drop, they are also following the similar trend in 2015. Just looking at the lower total production is not that convincing. Cnsidering the low gas nature of these wells, it looks obvious that PXD’s real EUR here is only heading to no more than 1/3 of what they claim now. I actually see that Newfield started to use more realistic lower EUR which is still more than 50% of what the actual numbers could do. I recommend always to be a bit careful making conclusions from the tails of these (thinning) curves, as they mix wells starting in different months, and not all wells in that group have passed that age yet. One way I often use to verify such findings, is by grouping the wells by the month in which they started flowing, as then no such mixing takes place. For this kind of tight oil wells, before the well was abandoned, no body knows the exact EUR. The main reason is the geology is too complicated. But it does not mean that we can not know the range. Reservoir engineers need to answer 3 questions. 1. How much oil per well spacing has, 2. how fast it can be recovered, 3. How much it can be recovered (EUR, resource times recovery factor). What Pioneers did, enhancing the stage and cluster numbers, is targeting the second one. It can boost EUR due to production cut off, but very limited if they do not increase well spacing. Here for well spacing I mainly mean the distance between two wells. For the lateral length, we can treat EUR on per feet basis if the width is the same. Increasing stage and cluster density can significantly increase the exposing to fracture area, and that is the reason for very high early production rate. But it reduces the time to reach pseudo steady state (pressure drop was felt everywhere, or most part), and production declines fast. For low stage/cluster density wells, it will be in transient stage longer and can maintain a slow decline for a very long time. For resource per well, we can estimate from the history wells. It can be quite high if they drilled in the best part (thick pay, high porosity). But on average basis, it should not change too much compared to the history well located reservoir. The production rate is a function of exposing area and pressure gradient. Once pseudo steady state is reached, pressure gradient drops fast. I do not know how much a certain well will produce, since the production is on per lease basis. But based on history production data, I am sure more than 1mmBOE per well on average basis is impossible. I am not sure if I answered your question. If you have well spacing data (acres per well) for new and old wells, please drop a line here. Please see page 14 for EUR that Pioneer presented. Hi Enno, ye xie xie nin. What I posted here is common sense for reservoir engineers. Pioneers must have many qualified reservoir engineers. I do not understand how and why the more than 1mmBOE EUR numbers come to management and present to investors. I collected some data for tight/shale oil for Delaware basin and this is actually the way they get the EURs for the newly drilled and completed laterals. Wall street is not purely playing numbers out of thin air, they actually have historic production numbers. 1. Vertical wells before targeting tight/shale oil has payzone about <200' deep, and could produce close to 40K Barrels of Oil over the years. 2. Now, with 5,000' lateral all in the payzone, and might even upgraded payzone geosteering and better completion/fracking, they should produce 25X 40K = 1million Barrels. 3. The IPs actually support this 25X increase and if not, at least 10~20X the historical vertical wells. So, in the first 5 years of production, LTO producers and wall street could easily defend their thesis of the sky is the limit EURs. But, now after 5 years of production, they have to face the questions. But, we are actually seeing only realistic 3~5X the EUR of a historic vertical well which drilling lateral payzone more than 25X the historic verticals. So, what's causing the differences? There are two issues here that shale oil or tight oil might be different from conventional production models. 1. The pressure might not be homogeneous in the stimulated volume even many years after production. The poorer the fracking process the longer it takes the pressure to balance. This is the case for shale gas and some tight oil already, i.e. some shale gas and tight oil wells persistently demonstrated quite low production decline after first 5 years of production. This is quite obvious as shown by this website data and plots for Marcellus and Bakken. 2. The recovery ratio so far for tight or shale oil has been way less than conventional oil, e.g. <2~5% for tight/shale oil versus 20~35% for conventional oil without water flooding. As you could see here, better completion/fracking and even tighter spacing should improve the recovery ratio with much ease and significantly improve the EUR. EUR in the Bakken increases over the first 36 months, but for months beyond 36 output is similar or less than earlier wells. It looks like overall recovery is pulled forward to earlier months with marginal increase in overall EUR. Perhaps the Permian basin will be different, but both Bakken and Eagle Ford have shown this type of behavior. The 600 kb EUR estimate for the Bakken (back in 2012 by the NDIC) has not been consistent with well completion and output data. The actual EUR has been in the range of 300 to 350 kb for the North Dakota Bakken/Three Forks. So far the average Permian well has not surpassed the ND Bakken/Three Forks wells for 36 month cumulative average output. It will be interesting to see if the rapid productivity increases of the past few years will continue in the Permian basin. I do not expect there will be much improvement beyond 2018. I agree recovery factors may have improved a bit. This depends critically on what happens after year 6, which for most basins we can only guess at. I believe the Permian will follow developments in the Bakken, but this is speculation pure and simple. Frank would know better than me, but he may be bound by confidentiality agreements and may be unable to share more than the great information he has given us thusfar. Mike Shellman also has a lot of experience and has probably forgotten more than I will ever know about the oil industry. You are right the main increase is front loaded for Bakken, and in fact it is true for almost all tight oil basins. We have all know the unique property for tight oil/gas — “total production is strongly front loaded” is well established and few wells could break the convention. This is a curse as well as an advantage for tight oil/gas. The curse is that you could not use conventional wells’ slow decline for larger EUR projections; the advantage is that you could get return in a shorter period of time. Without this front loaded property, if EUR is still the same and only spread out production over 10 years instead of concentrating in the first 1-3 years will make tight oil/gas much less appealing to investors. Even though front loaded heavily, production after 2-3 years still matters because it will change the rest 25~60% of the projected EUR. Now, back to EUR/OOIP recovery ratio, it is also obvious we could increase this recovery ratio by either increase the first 2-3 years front loaded part (contributing to 40~75% of the EUR) or improve the slow production part after 2-3 years (contributing to 25~60% of the EUR). One can not deny either directions of progresses made. In fact, even bashers agree that after better completion/fracking and higher IP and even faster drop, the slow production part is not getting worse if not slightly better — the slopes are clearly shown here in this website. Thus, the recovery ratio is undeniably improving. Here is a summary of my observations of improvements for major basins from this great website. 1. Bakken: only 1st year IP improves 30~80% in 2015-16 when compared to the previous 2012-13. Improvements not significant for the 2-3 year or later when comparing 2013-15 wells to previous wells. 2. Permian: 1-2 years both improves significantly by 50~100% with similar period, but not enough evidence after 2 years yet. But IP for Permian starts lower than Bakken so now in terms of first 2-3 years production the two basin’s are getting closer. In terms of production after 3-4 years, Permian is still lagging behind Bakken. 3. Eagleford: 1-2 years improves 50~100%, but not the production after 3 years. And it drops to the lowest level when compared to Bakken and Permian after 3-4 years, no sign of improvement yet. 2. For gas in Marcellus, the improvements are obvious for first 1 year and not so during 2-3 years. But the production after that (>3 years) improved significantly (>50%) for the wells that have the production data (2013-14 versus 2010-12 for 3-4 years, and 2010-2013 for >4 years). Thanks. I am not a reservoir engineer, but have a BS in Physics (long ago) and many courses (3 years undergraduate, then switched to physics) in mechanical engineering. All the data I have I get from Enno Peters here, I am more interested in the average for the Permian Basin rather than individual well performance. For Permian basin wells which started producing in the first quarter of 2016 I fit a hyperbolic to months 2 to 13 (qi=25,900 b/month, b=0.95, and Di=0.28) using least squares. The tail after month 165 (13.7 years) is exponential decline at 7.2%/year. This is admittedly very simplistic as I have very limited data. I assume the well reaches its economic limit at 10 b/d at about 20 years and is abandoned at that point. EUR (oil only) is 349 kb, NGL and natural gas would add about another 25 kboe for a total EUR of about 375 kboe. Pioneer has better wells (very limited number though) at an EUR of 480 kbo and maybe 520 kboe. 3. Eagle Ford is showing b close to zero or exponential with it wells over 5 years history, while its gas showing b somewhat better. I have been following PXD wells here at Enno’s website for over a year, and it seems that their 2016 and 2015 version 2.0 and 3.0 wells still have a huge drops (>50% in a quarter) at 300-150 BOEPD and 150-50 BOEPD. This later huge drop off means one simple fitting or even two stage fitting can not give close EURs. Possible causes are: offset interferences and water flooding. When the hyperbolic well profile falls to about 8%/year decline I use exponential decline at 8%/year for the tail. I also assume the well is abandoned when output falls to 10 b/d or less. This profile may be too optimistic, we don’t really know what happens in later years, we have the longest database in the Bakken from 2008 to 2017 so about 9 years. We can assume the Eagle Ford and Permian may behave similarly, but this is also likely to be optimistic in my view. you can not just use a simple hyperbolic function to fit and extrapolate the production after 60 or 100 months. The fact that Pioneer’s production curve have some sudden drop offs (one at from 300-100, and one at from 100-50) in history is puzzling and they can not be fitted with a hyperbolic function. If they repeat in the future it will seriously affect the EUR. I double checked Pioneer by fitting a hyperbolic to 2016Q1 wells for natural gas. I also assumed 25% of natural Gas goes to NGL at 0.21 b NGL per 1000 CF Nat gas. EUR of average 2016Q1 Pioneer Permian well is about 720 kboe and 450 kb of oil. For decline analysis , reservoir and none reservoir engineers will get similar results. There is some theory basis if the well bottom hole pressure maintains constant, and also the driving mechanism is the same. Please see the next paragraph. But generally speaking it is an empirical method mainly based on observation of history wells. Your background is enough to do it. Most of Permian tight reservoirs can not conduct water flooding due to very low permeability. It uses its own energy (pressure differential and compressibility) to make it move. The driving mechanism is liquid expansion at early time, and switches to gas expansion when reservoir pressure drops below oil bubble point pressure. Resource volume in one well spacing area is a constant number regardless how the completion efficiency is enhanced. If more hydrocarbon is produced in early time, less will be left in the reservoir, and also the same for reservoir energy. Since the production and decline chart is not available in Pioneers presentation, I guess probably the same decline rate is used, based on early time production, to get more than one mmboe EUR. To make sure I understand you final sentence correctly. If the early well profiles (say from 2013 or 2014) were modelled using aa simple Arps hyperbolic. I think you may be saying that newer wells (from 2016 for example) might be using the same D_nought and b and simply assuming the higher q_nought (IP) is simply shifting the well profile vertically without changing the overall shape. Is that roughly correct? I realize that there are more sophisticated well profiles than the Arps equations, but I am less familiar with those. @All, thanks for all the high quality comments, great stuff. I hope to be able to show more data on what is behind these changing well profiles within the next months. I notice that the cumulative production values of the total Permian wells in the first 12 production months for the years 2014 and 2015 are still getting minor modifications. They are (slightly) different now compared to the report a few months ago. What’s the reason for that? That is indeed possible, although I would expect those changes to be minor. Each month I run the full allocation algorithm based on all production data, and the RRC often revises data up to 18 months earlier. Since some of those 2014 started in the end of the year, the results for those are still impacted. That’s why I still recommend to look at larger samples of wells in Texas. I expect those changes to be much less for the New Mexico part, as there individual well production is given, and adjustments aren’t very large so far back. I’m new to your site, so apologies for the rookie questions. Using the well quality tab and the cumulative production profiles graph, I see the following. *2016 has a total number of wells of 1895, after 14 months of production that reduced to 156. *2015 has a total number of wells of 2574, after 14 months on production that was still 2574, but started reducing very quickly after, down to 223 after 26 months. I guess I have two questions. What happens to the wells that drop out of the data set, do they cease production? Secondly, would it be right to assume that the 2016 wells produce at a higher initial rate but ultimately have a higher decline rate? Welcome here, and there’s never a reason to apologize for a question. It also helps me to understand what is still not intuitive. The time unit I work with are calendar months. Suppose we have well A that started on 19th of Jan 2015, and well B that started on 24th of Dec 2015. If we group these wells by the year in which they started production (which is the default grouping in the “Well quality” view), then these 2 wells will both belong to the 2015 group. In this post, the data runs through Feb 2017. So well A has 26 calendar months of production according to the latest data, and well B has 15 calendar months of production. That’s why the 2015 curve starts thinning (including fewer wells), fast after 15 months on production. For the 2016 curve this is after 3 months. When wells stop producing, I still include them, and assign 0 production to them. This is in theory. In practice, for Texas, due to data issues, you sometimes do see a well dropping out, but these numbers are very small. (in these cases, certain wells did not yet have production reported until the final month like most others). So because we group wells that started within a year, they all have a different number of calendar months under their belt, and that is shown by both the numbers, and the thinning of the curves. You will see that this effect becomes much less, if you group wells by the quarter, or month, in which they started. Basically, you almost do not have these ‘incomplete tails’ anymore. Because these tails are incomplete (not all wells from the category have reached that age yet), it’s also better not to read to much into movements of these tails. For example, if the wells early in the year behaved quite differently than the wells later in the year, you will see these tails making quite strong movements once more data comes in. > Secondly, would it be right to assume that the 2016 wells produce at a higher initial rate but ultimately have a higher decline rate? I prefer not to opine too much on what wells will do ultimately, beyond on what the data already shows. I don’t like to be wrong. Here is another simple calculation of the OOIP (original oil in place) and EUR recovery ratios. Here are the basic numbers I used for a tight oil well. If we reduce the radius of simulation to 50meters, or 166feet, then we should still get 110K BBLs. For EF or Permian, where it is overpressured, and EUR is limited to just over 100K BBLs, there is a reason that E&P companies are pursuing tighter spacing and better completions to improve the EURs. The completion improvements will reduce the length of nanopore throat, therefore reduce the pressure drop needed to better push the super critical gas phase (for 45API oil with over 1:1 GOR mix with over 300bar pore pressure at 80C) LTO out more completely. Once the pressure drop below the bubbling point (200~300Bar), oil liquid and gas separates in the pore throat, oil flow will just dwindle to almost zero, and plug the pore throat as well. The above calculation confirms the very low recovery ratio of current tight oil wells. if we use over pressure number of 1.3 at a depth of 3,000meter (10,000′), we are talking about pore pressure of 400bar, OGIP only about 37 BCF, and the recovery ratio has to be over 15% to get EUR in Marcellus over 6BCF!